Improved yield in seeding year. Better yield in later years if alfalfa injured by winter, insects, disease. 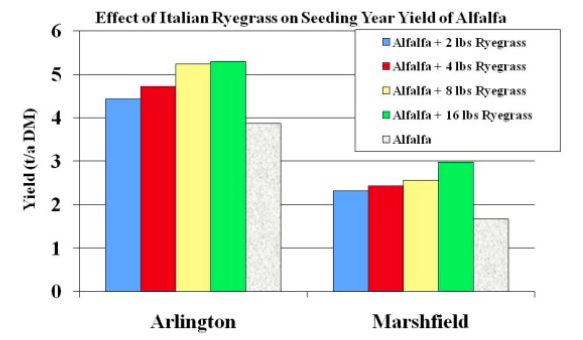 Alfalfa grass mixtures provide stand and yield over broader range of environmental conditions. Grass remains in low spots were water stands. Grass may not suffer winterkill. Suffer less traffic damage and tolerate manure application better. If grass grows in later part of season, may widen harvest window. 30% grass mixed with alfalfa dries faster than pure alfalfa. Alfalfa-grass mixtures provide greater erosion control than pure alfalfa stands. Alfalfa-grass mixtures produce more palatable haylage than pure alfalfa. Adding some grass to alfalfa stands may benefit the dairy ration by lowering NFC because grass has less NFC. 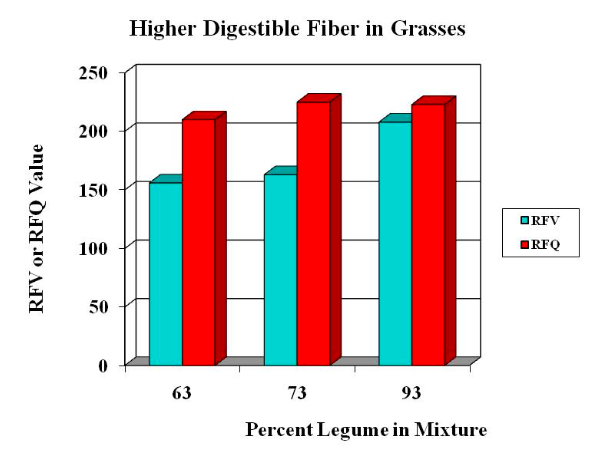 Higher total fiber with grass/legume mixtures but faster rate of digestion of grass NDF. Reduce lameness associated with too much nonfiberous carbohydrate (NFC). 20 to 20% of milking cows are mildly to seriously lame in Midwest United States (Cook, Oetzel and Nordlund, 2003). This results in increased veterinary bills and reduces milk production (see table). Causes: 58% due to disease or trauma, 42% due to nutrition (excessive grain and/or inadequate fiber). Faster grass fiber digestion may allow increased NDF in ration without reducing intake or milk production. Possible good fit with high NFC diets (i.e. high corn silage diets).